Where have we pedaled to now? Happy Friday! Welcome back to Guess Where photographic series. The creperie cafe is a well-known landmark for cyclists climbing the Col de Peyreourde in the French Pyrenees. The climb of Col de Peryresourde is 15.27km long, and averages 6.1% grade, with the steepest sections a tough 9.8%. The gradual mountain pass connects the towns of Bagnères-de-Luchon and Arreau. The Col de Peyresourde was first used in the Tour de France in 1910. In 2012 the pass will be climbed in Stage 17 before the final climb to the mountain top finish of Peyragudes. 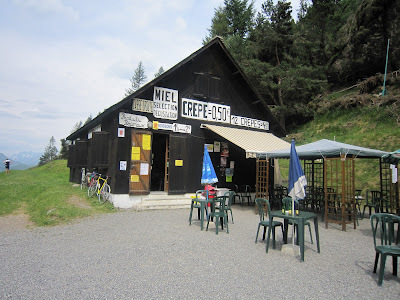 The site of the creperie signals a cyclist has arrived at the top of the Col de Peyresourde. Sit and enjoy your triumphant climb with a few crepes. This is not the kind of place where you should order just one crepe, they will happily serve a plate full (as you can see the prices are reasonable). I can guarantee that most Tour de France riders nary glimpse this landmark during the race, as hundreds of fans crowd it's friendly patio. The creperie is best visited on a non Tour de France day when you may sit and watch cyclists pass by and enjoy the beautiful green landscape. Inside the creperie the owners are very friendly and ask every visitor (in surprising English), "Where are you from?" In 2010 two cyclists from Colorado wandered in for a crepe, when asked where they were from, the owner replied, "a woman just left from Colorado!" That woman was me, and the two Coloradoans were Tom and Courtenay whom I met by chance 1 year later on Independence Pass at the USA Pro Cycling Challenge. Small world. The 80-foot sculpture is located along the peage tollway in the center of the Pyrenees, in the region of Midi-Pyrenees. 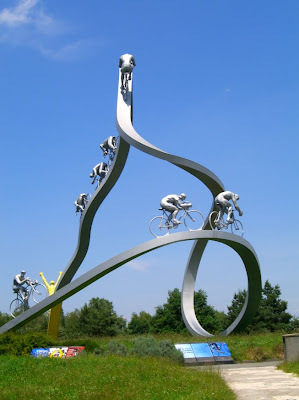 The sculpture was created to honor the Tour de France. It was inaugurated in 1996 in cooperation with organizers of the Tour de France and highway officials. Designed by artist Jean-Bernard Métais, and made from 30 tons of steel, it is located at Les Pyrénées aire peage reststop. The sculpture displays 12 panels around the base depicting a history of the riders and Le Tour. If you are driving along the A-64 (E80 La Pyrénéenne) peage, between exit 11 and 12, and happen to see the rest stop (aire) sign for Les Pyrenees, east of Pau/west of Tarbes (I believe you must be traveling in the eastbound direction to access this rest stop), get off the highway, drive behind the gas station, park and walk up to the sculpture. It is truly wonderful. 11 (Soumoulou) towns served: Soumoulou, Nousty, Lourdes via RD940. In 2009 the opening stage in the Giro d'Italia featured a team time trial on Lido de Venezia near Venice, Italy. The Piazza San Marco is the primary public square in Venice and has been referred to as "the drawing room of Europe. The Piazzo is commonly listed first as the most recommended tourist site in the city. 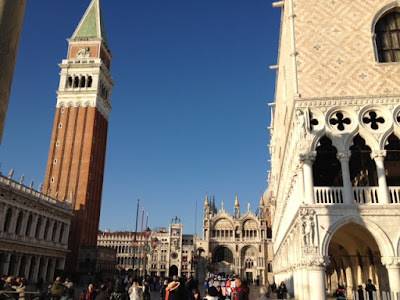 Known simply as the Piazza or St Mark's Square because of the great Church of St Mark's (Basilica Cattedrale Patriarcale di San Marco, consecrated in 1094) located at one end, no motorized vehicles are allowed, simply strolling tourists. Nearby is the famous clocktower Torre dell'Orologio. My nephew Kenny wrote home this week describing the clock, "it was built in the 15th century, and tells the hour on a 24 hour system, the phases of the moon and the motion of the sun. 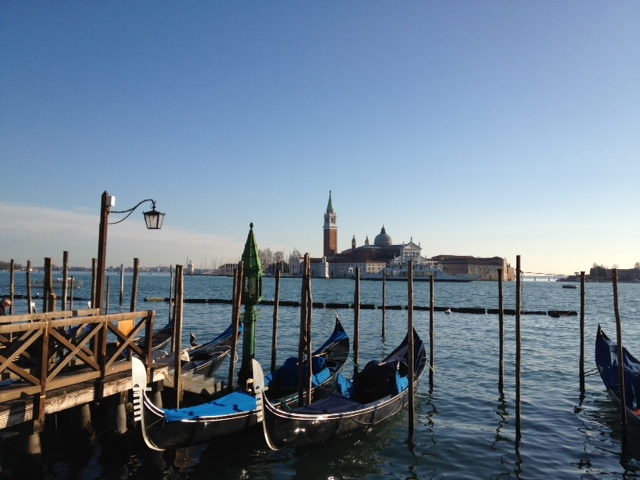 He mentioned "you get a view of the waters surrounding the Piazza along the Puazzetta San Marco. 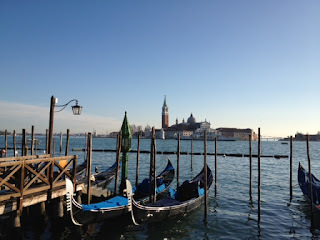 I sat on a bench and glanced at the passing ferry taxis." Ah Italy! Labels: France Travel, Guess Where?